﻿﻿San Antonio artist Don Yena collects artifacts to enhance the authenticity of his Western art. ﻿﻿﻿Sprawled beside his horse and clutching a chest wound, the cowboy struggles to stay alive as more incoming bullets kick up dust around him. His two companions return fire at the mounted men charging down the hill. Strands of barbed wire strewn across a cattle trail near a pair of dropped pliers tell the story: the ambush of fence cutters in 1880s Texas. With the dramatic action and sweeping vistas of a cinematic Western saga, the painting captures a moment in the deadly confrontations that unfolded in the fence-cutting wars near San Saba and Mason as the days of the open range came to an end. “I paint ‘once upon a time in the West’ with authenticity,” Donald M. Yena says with a chuckle in a cluttered, museum-like room at his home in Hollywood Park, a San Antonio suburb. He points at a 36-by-60-inch oil painting — Fence Cutters, Hot Lead and Tempers, one of a landmark series of 12 illustrating the Texas cattle industry from vaqueros to oil — and then points at items around the room. The fence pliers are there. So are the classic stockman’s open-rig saddles, the hats, boots and spurs, the Winchester 1866 rifle, the Colt single-action revolver and single-loop leather holster. All are depicted in the painting in painstaking detail, with an eye not just for aesthetics but also for historical accuracy. For Yena, art and artifacts are as intertwined as a horsehair lariat, so it’s impossible to say where the Western artist ends and the collector of Western memorabilia begins. “The artwork allows purchases for the collection; the collection allows the authenticity in the paintings. There so are many Western artists today who don’t know a Colt single-action from a cap pistol. There’s no reason to blow it historically,” he says, recalling a scene that got it wrong in the TV miniseries Lonesome Dove. Chased down by Blue Duck and other bad guys, Gus McCrae kills his horse to use as breastworks. He pulls out a Henry rifle and puts a bullet in the gut of one of his tormentors hundreds of yards away. • The original watercolors and pen-and-ink drawings that illustrate the 1968 Texian Press book Six Flags of Texas at the Texas State Library and Archives Commission. • A series of paintings commissioned by late Gov. Dolph Briscoe of Frio Town, once the county seat of Frio County and now a ghost town, at Security State Bank–South Texas in Pearsall. • The Outfit, a well-known chuckwagon scene, at the Texas Community Bank of Laredo and, at its sister bank in Del Rio, Mescal and Muddy Water, showing smugglers in the early 1900s crossing the Rio Grande. • The Medina, Cypress and Settlers, depicting an early settler and an ox-drawn wagon, at Castroville State Bank, which also displays about 30 of Yena’s artifacts pertaining to Medina County. • A number of oil-related works and a display of gambling artifacts at the Petroleum Club of San Antonio. For Yena, searching for artifacts is a never-ending treasure hunt at flea markets and Western memorabilia shows, as well as by word of mouth. Early on, Louise, his wife of 54 years, also became intrigued. While he pursued stirrups, playing cards and items from the Spanish Colonial period, Louise focused on kitchenware and learned enough to write a book on coffee and tea collectibles. Retired from teaching at David Barkley Elementary School in San Antonio, Louise researches and documents both of their collections using everything from the Internet to old magazines and out-of-print books she’s bought for prices ranging from 25 cents to several hundred dollars. In 1994, the Witte Museum in San Antonio purchased the Donald M. and Louise M. Yena Collection of more than 2,000 pieces. They immediately began amassing more. One of Yena’s favorite pieces from the Witte purchase was a mid-1850s .50-caliber rifle marked by Charles Hummel, a gun dealer in San Antonio. Last year, the Yenas made another donation to the Witte: a collection of extremely rare items from Indianola, once Texas’ second busiest port but wiped off the map by a hurricane in 1886. It includes a locket with a woman’s photograph, documents of everyday transactions and a smoothbore firearm. The engraving on the barrel — “F. Klam­berg Indianola Texas” — proves it belonged to a settler. 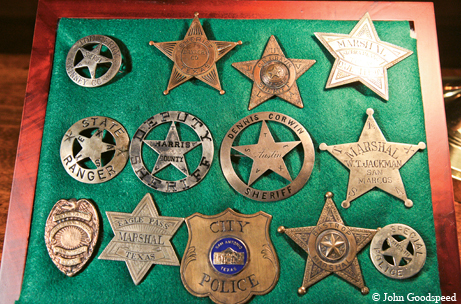 The Indianola donations and other items from the Witte’s Yena collection will be displayed at the museum’s new, 20,000-square-foot South Texas Heritage Center, scheduled to open in early summer 2012. 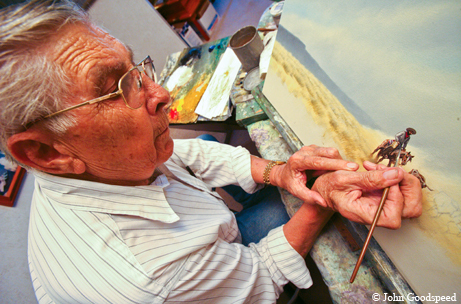 In 2009–10, the Witte presented Don Yena: Painting the South Texas History. Believed to be the only one of its kind, the series of 12 oil paintings illustrates the history of the cattle industry, from wild longhorns in the late 1700s to the oil boom and the end of an era. The paintings convey strong emotions, such as an angry cook watching rain pour off a chuckwagon fly, a blazing shootout over grazing rights and an old cowboy at the end of his trail. Yena’s skill at creating a three-dimensional effect is enhanced by vivid colors, soft hues, dramatic landscapes and big skies. Fine details are found there, too, from perfect reflections in water to inconspicuous creatures, such as a horned toad resting in the shade. Inspired by the exhibit and wanting to buy a painting, investor and entrepreneur David MacBurnett tracked down Yena. Not wanting to break up the series, Yena showed him others at the Petroleum Club. MacBurnett purchased three. While Yena believes the cattle series is his crowning achievement, he is not resting on his laurels. Since completing the series early last year, he has painted more than a dozen canvases at the kitchen table studio on his ranch outside Castroville. For Yena, the circle of artifacts and art is unbroken, and ensures that the Old West lives on forever.